The country house “Sophienholm” was built in 1769 by Theodor Holmskjold, director-in-chief of the Danish Postal Services. In 1790 it was sold to a wealthy merchant, Constantin Brun, who commissioned the renowned French architect Joseph-Jacques Ramée to carry out a thorough renovation, and 1800-1805 it was virtually completely rebuilt and exlarged to reach its present appearance. Constantin Brun’s wife, Friederikke Brun, was in her day a well-known writer of travel books, as well as being a song-writer and a poet. 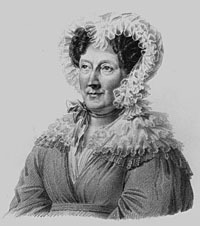 She was equally well known for her musical and literary salons in Geneva, Rome and, not least, Copenhagen. At Sophienholm she gathered round her the foremost writers, poets, musicians and composers of the day, i.e. the so-called Danish Golden Age together with also European colleagues. In 1963 the Lyngby-Taarbæk town council purchased Sophienholm. It was gingerly restored and four years later, 1967, made open to the public with an exhibition of art from the Danish Golden Age, c. 1800-50. It was restored again in 1994, with new flooring, new interior lighting system and a new security alarm system. The gardens of Sophienholm are unique in Danish landscape gardening tradition. From the very beginning it was designed by J.J. Ramée in the style of a typical “English”, i.e. a romantic, landscape garden. Though a well-preserved romantic overall structure can still be recognized the park has been enriched with valuable additions and alterations by some of the owners, many of whom were especially interested in gardening. The town council undertook these changes and additions in order to make the splendours of the place more readily accessible to the general public. In this way Sophienholm has been turned into more than just an excursion destination. Here you can enjoy a sensitively shaped piece of nature with open grassy stretches and beautiful, old trees. 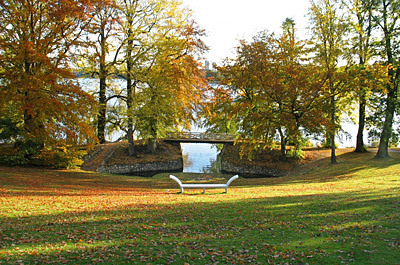 It is also a place where the development of Danish landscape gardening over 200 years can be studied. Today Sophienholm is an exhibition hall, owned by Lyngby-Taarbæk town council. Situated in a beautiful park overlooking Lake Bagsværd and annually hosting four or five major art exhibitions it attracts visitors mainly from the Greater Copenhagen area. All the year round minor exhibitions are open in the Cobra Room – a former woodland hut where in the 1940s a group of artists used to meet to revel, drink, paint and debate. It has since been converted into a museum annex. During the summer season various arrangements, concerts, and entertainments take place in the surrounding park. Sopienholm pursues an exhibition policy that is focussed on themes of current interest and on exhibiting works of art by renowned artists as well as arranging exhibitions relating to themes in art history. The emphasis is particularly on national topics, but also more general European, – not least Scandinavian, themes are in our focus of attention. The aim is to ensure both high quality, current interest and comprehensiveness. In other words, the needs of both the general public and those of a narrower circle of connoisseurs have to be catered for without compromising the highest standards imaginable. We take pride in our efforts to as far as possible present art in a contemporary setting. We at Sophienholm are happy to have the privilege of a large and varied public. In recent years the exhibitions have drawn an average of 50-60,000 visitors each year. In the environs of Sophienholm a number of works of art are on display. The most distinctive is Eremitagen og bjergbestigersken by sculptor Hein Heinsen and landscape architect Torben Schønherr. It is a 1993 gift from The National Art Foundation. Visually and philosophically the basis of the work is the Norske Hus – a cottage which during the summer, the original proprietors of Sophienholm used for social purposes. Sculpture, landscape gardening, architecture, furniture making, literature, history and philosophy are all constituent parts of Eremitagen og bjergbestigersken – combining cultural and minimalistic aesthetics in an attempt to trigger our imagination.